Arcade games have come and gone, and in many cases, arrived again. Video games are here to stay. Tablets and phones have created new venues for aspiring game makers. But despite the incredible advancement of video games, board games are still a huge market. Board games exploded in popularity in the early 20th century and have never really gone away. Now an increase in nostalgia and a wave of board game cafes have helped create a surge in traditional board games, which were up nearly 20 percent in 2017. 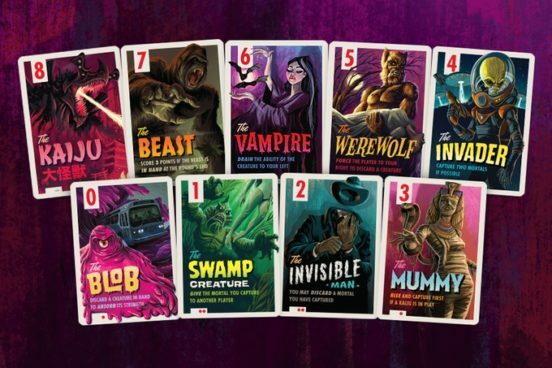 Designer Josh Emrich is the designer behind Campy Creatures, a Kickstarter-funded game now published by Keymaster Games. The game makes each player a mad scientist tasked with the goal of capturing Mortals for future experimentation. “Players have an army of Campy Creatures to do their bidding with three nights to get the job done. Be warned though—the Mortals won’t go out without a fight,” says the game packaging. Emrich explained that to create the look for Campy Creatures, he watched hours of classic horror films, and poured over pulp novels and old movie posters. 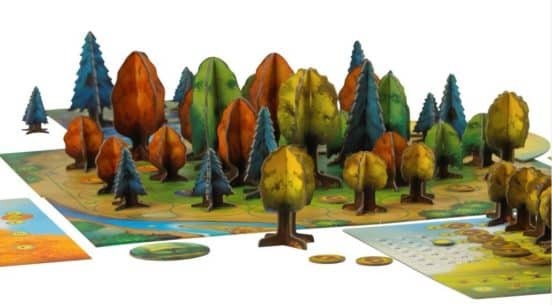 Photosynthesis is a green strategy board game that finds players planting and shaping a forest, cultivating both seeds and strategy. The publisher explains that you will take trees through a full life cycle, collecting points as the leaves collect energy. The gorgeous graphics are designed by Sabrina Miramon and were designed to show off the beauty of the natural world. 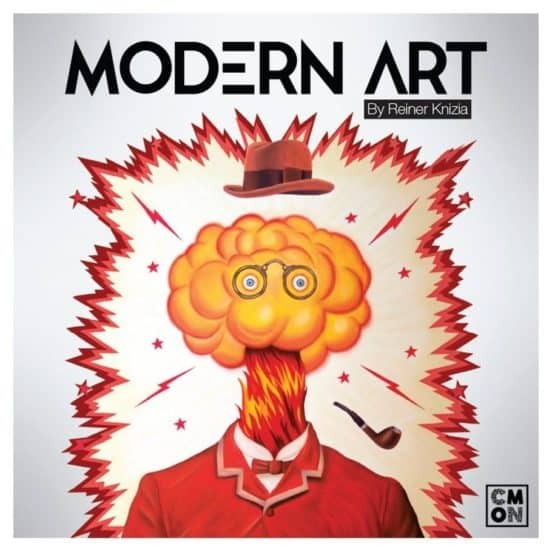 Modern Art is a game all about the high-stakes world of buying and selling paintings. The game was conceived as part of the Kinzia auction series. Its players must analyze the paintings of five different artists, as both buyer and seller, turning a profit on both sides. To do this, the player must auction a painting on each turn. If another player buys the painting, the player is paid, but if it doesn’t seel, the player must pay the bank. The winner is the person who makes the most money for the museum. 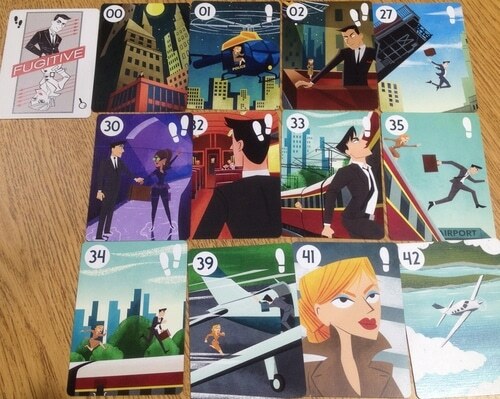 A two-player deduction card game, the publisher describes Fugitive as “ full of close calls and great escapes – all packed into 10 minutes! It’s a quick, intense chase between the Fugitive, who is trying to get out of town, and the Marshal, who is trying to catch him before he does.” Tim Flowers created the game, and hired Ryan Goldsberry for the art. At first they thought it would be too art intensive to make over 40 unique cards, but Goldsberry decided to just go for it and tell the entire story of a chase in over 40 totally unique cards. 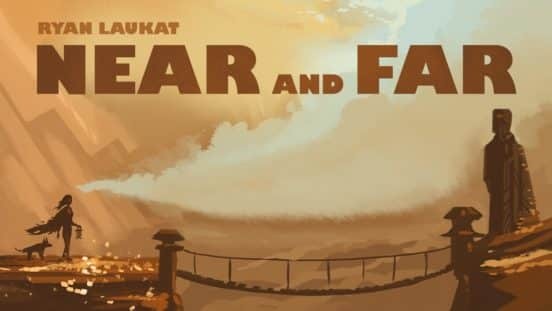 Near and Far is a game that puts you in the search for a lost city and world of ruins. Your job is to manage and recruit new adventurers, each with their own unique identity, skills and weaknesses. Designer Ryan Laukat was responsible for illustrating the game by connecting it with predecessor Above and Below, while not repeating the motifs. The result is a game with deep oranges and burnt yellows, contrasting to the blue and green of the other game. The game looks like a visual map, and is infused with subtle details from the art deco era.